" Prepare to be keelhauled, you scurvy dogs", shouted the pirates. "Let us now sacrifice them both to great Splod !" shouted the people with shiny black hair. "They stole my eye! Twice !" rumbled mighty Splod. "Ve vant those willains and warmints wiolently vound up,"proclaimed a tall lady wumpire with long fingernails.The piranhas said nothing, but they thrashed about in their bowl, ominously. Of late, I have been reading a lot of books for children. Books where friends/brothers - sisters go on adventures, explore and discover the world around them or go to far off lands. Then there are some where animals and birds talk and behave like us humans and tell their story. 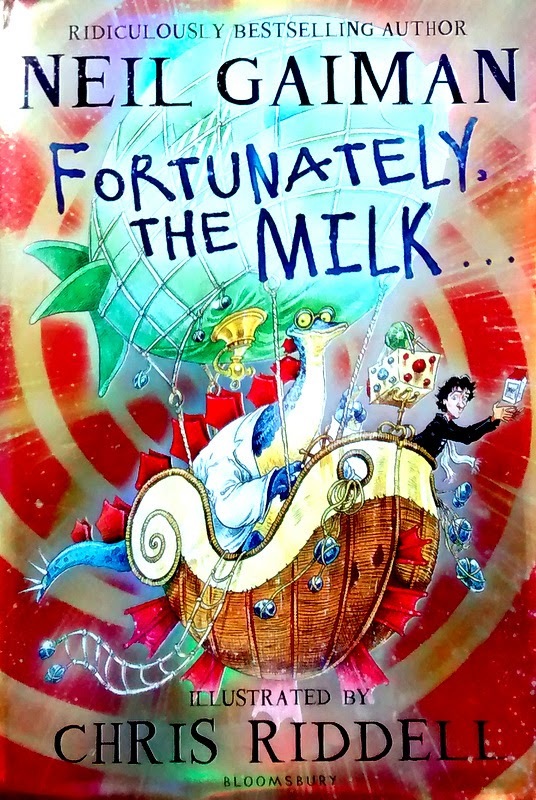 'FORTUNATELY, THE MILK...' by Neil Gaiman and illustrated by Chris Riddell is different. It is a delightful story of a father who goes to fetch milk from the corner store, for his kids and returns to tell them the weirdest of adventure he went on whilst on his way back home. Yes !!! it's about DAD's adventure told in the voice of his son. It has time travel, aliens, dinosaurs, vampires,pirates, volcano, hot air balloons. Dad is kidnapped by Aliens.In an attempt to escape from their clutches, he opens the wrong door and lets the Time-Space Continuum in. Had it not been for Professor Steg, a learned Stegosaurus and inventor, in his 'Floaty-Ball-Person-Carrier', he would have been eaten by sharks, sacrificed to Splod the volcano God, ended up as meal for the vampires. Here, the Tyrannosaurus rex, Pteranodon,Ankylosaurus,Diplodocus are not creating havoc but are the Galactic Police, saving people all over the Universe and riding fast space bikes. Through this whirlwind adventure, Dad manages to protect and hold on to the milk carton, uses it to scare the aliens and finally brings it safely home to his son and daughter. 'FORTUNATELY, THE MILK...' is an extremely exciting and enjoyable read. I would recommend it to young readers, 8 years and above. Before the child starts reading the book, a little talk about time travel and time machine would be great. For readers, who are reading time-travel fiction for the first time, it might be a bit confusing to understand the frequent shift of frames.Enquiring about the story on and off, occasionally reading it together will add to the fun. All through the story, the brother and sister keep asking their Dad probing questions about his adventure. It encourages kids to be curious and ask questions. For kids who love dinosaurs, it is a bonus. It is funny, entertaining little read. Available in Flipkart and Amazon.